How can we make relative temperature differences visible to the naked eye, and why is this important in the Newfoundland context? A distinct characteristic of outport Newfoundland communities is common space. Rooted in the medieval open-field system, the Commons is shared public resources open for anyone to use. 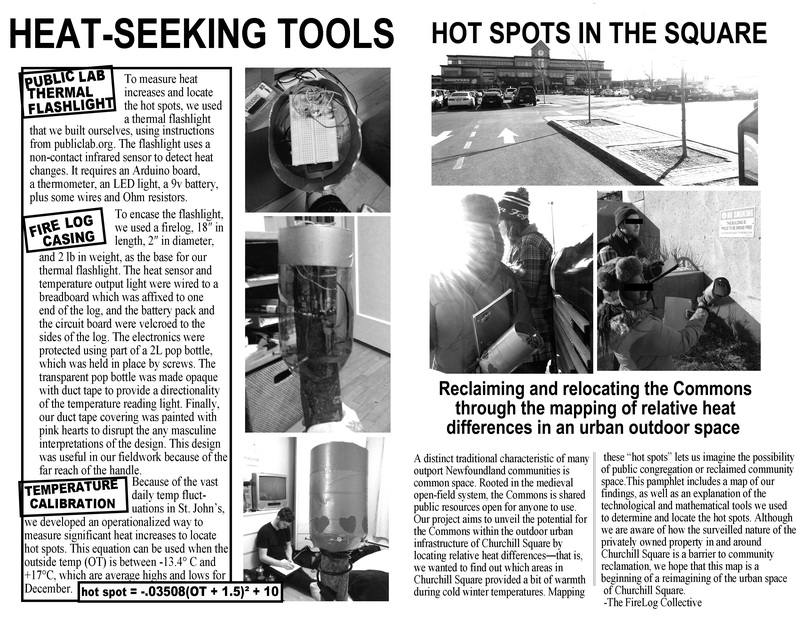 Our project aims to unveil the potential for the Commons within the outdoor urban infrastructure of Churchill Square in St. John’s, Newfoundland, by locating relative heat differences—that is, we wanted to find out which areas in the Square provided a bit of warmth during the long, cold winter. Locating these “hot spots” lets us imagine the possibility of public congregation or reclaimed community space. 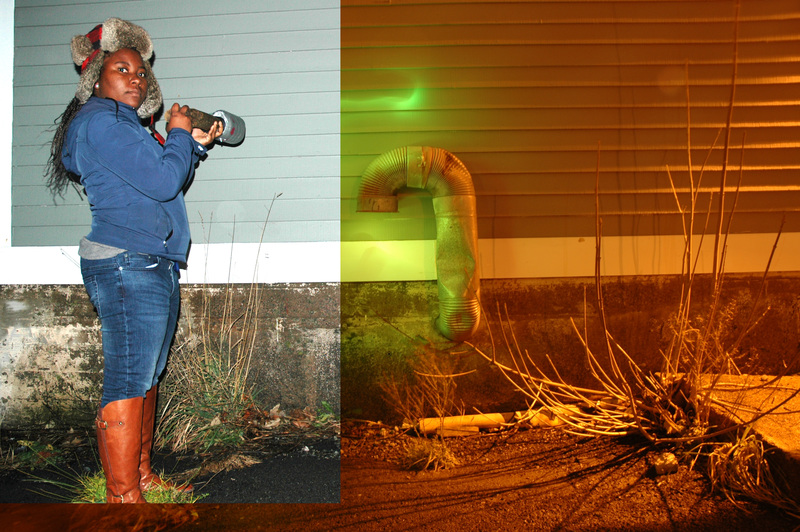 To measure heat increases and locate these hot spots, we used a do-it-yourself, open-source thermal flashlight using instructions from Public Lab. This flashlight uses a non-contact infrared sensor to measure heat differences. Temperatures above and below pre-programmed levels are indicated with a red light for high temperatures and a blue light for low temperatures. Middle-range temperatures are green. Newfoundland Folklorist Gerald Pocius (1991) identifies The Commons as a distinct feature of Newfoundland outport communities. Drawing on his ethnographical work on Calvert, on the Southern Shore, Pocius writes that this form of land division, “exhibiting the vestiges of the medieval open-field system, ” (p. 124), meant that a prominent characteristic of the landscape of the outport community is land not owned by any particular person but is used by whomever needs it at any article time. This includes common grazing lands, where animals owned by various people intermingle, agricultural land which changes hands every season, or berries and fish, which require skill to acquire but are equally open for any resident to have his or her hand at. Pocius writes that even if land is known to be owned by a particular family, if unused it will uncontroversially be taken up for use by someone else, “so as not to be ‘wasted’” (p. 134). Using this notion that immediately uninhabited space has the potential for waste and should be open for community reclamation at any point in time, we sought to map a nearby urban area, Churchill Square. Churchill Square was of particular interest to us because a “town square” is usually a pedestrian area for community gatherings surrounded by small shops. Churchill Square does have an array of small shops and restaurants, seemingly more diverse than other shopping areas in St. John’s. Given the geographical features of St. John’s that create inhospitable weather conditions, we aimed to map the invisible thermal infrastructure of Churchill Square. This urban mapping project builds on renewed academic interest in public spaces, especially in urban areas from critical urban geographers, cultural theorist, and artists who claim that we should rethink what these spaces are and have come to be. There is also growing public discourse on public spaces stemming from issues of increasing homeless people on streets, a crisis of common areas in cities, increasing commercialization/privatization of public spaces, violence against women in public spaces, and security technologies in these spaces (Mitchell, 1996). Our project is largely informed by the idea that the city is something in the ‘making’ (Simone, 2011), and that urban spaces are constituted by the subjects and socialites of the people who live in it and as an assemblage of human and nonhuman interactions (Amin 2008; Latour & Hermant 1998). That is, we can configure how the urban is experienced/done and we can ‘do’ public spaces in diverse ways. Using the flashlight to measure heat differences, we located and mapped hotspots in the Churchill square area of St John’s. 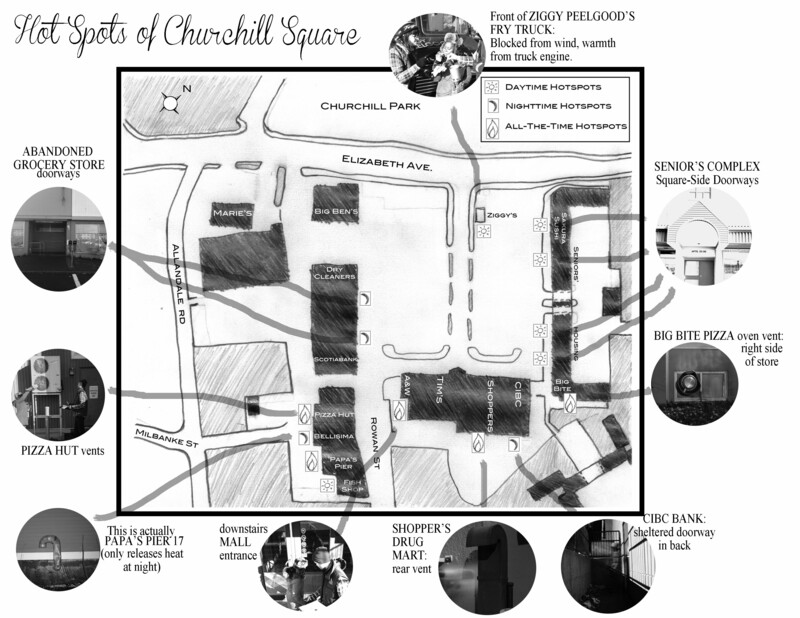 These hotspots we believe expand the community use of the Churchill square area. More importantly and from a social justice perspective, it allows privately owned infrastructure to be used in diverse ways by a broader spectrum of people, particularly for shelter and warmth. In this way, heat leaks and “waste” heat are not an inherently bad things, but become the potential basis of a common good. 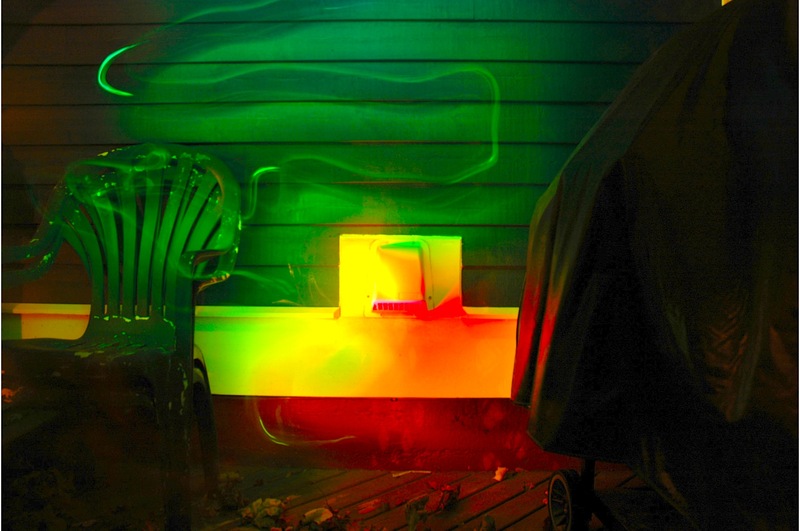 The red (high) setting, which served as a indicator of a hot spot, was operationalized using the following equation: hot spot = -.03508(Outside Temperature + 1.5)2 + 10 This equation was used because we wanted to use our thermal flashlight to locate outdoor spaces which offered a significant increase in temperature. That is, we would be using it to measure changes in temperature, rather than just measure a constant. Because of vast daily temperature fluctuations in St. John’s, and how outside temperatures would affect heat changes within the hotspots, we operationalized our temperature measurements by using a mathematical equation that can be used when the temperature is between +17 C and -13.4 C. The equation we used was to set our thermal flighlight during each field work session was: high temperature setting/red output = -.03508(OT + 1.5)C + 10. See full report for details. This research and writing by Grace Akese, Juls Mack & David Mandville is licensed under a Creative Commons Attribution-NonCommercial-ShareAlike 2.0 Generic License.